I still can’t get my head around this. Can someone provide an example of the Resolution Phase with three Captains and two succeed? Captains Leela (Type S Scout), Ziff (Beowulf) and Brannigan (Subsidized Merchant, cause it's got curves) are all pursuing In The Presence of Mine Enemies. It has two attached , and the play order is Ziff, Brannigan and Leela. 1. Ziff, as the first captain, selects a and resolves it. 2. Brannigan, as the second captain, selects a and resolves it. 3. Leela finds it has no complications, so she passes. Because it had no when she passed, she is eligible even though she did not complete any . 4. It comes back around to Ziff, who passes. He is now eligible. 5. Brannigan passes. He is eligible. Then, all eligible captains may attempt to resolve it. 1. Ziff spends the and , resolving the contract. He also has for the second . 2. Brannigan cannot complete the contract because he has no . 3. Leela completes the contract and has and . Ziff gains 4 (3 from the because the are reduced by 1 since multiple captains completed it). Leela gains 6 (3 from , 2 from first and 1 from the second). 1. Ziff resolves a . 2. Brannigan cannot resolve the , so he passes. Since he passes when the has attached , he is ineligible. 3. Leela resolves the remaining a .
Ziff and Leela are both eligible, and may resolve the . When does the card get removed to the discard pile and replaced by the owner? Since all Captains have a try at it before it is removed ... I’m thinking card removal is done after all Captains in the game have went through Contract resolution (on that mission or a different one). 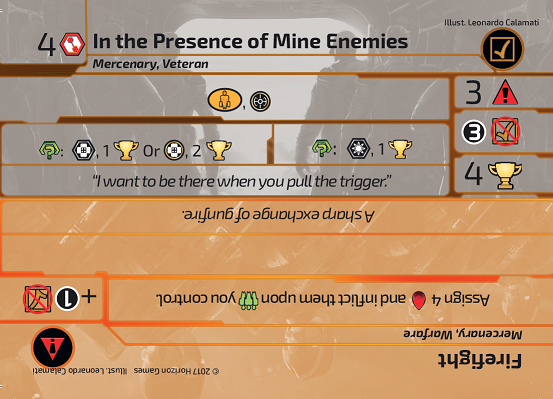 Example: there are Captains a b and c. That is also their initiative order. A and c are in the same contract. B is in a different one. A resolves contract. B resolves contract. C resolves contract. Then who removes which contract first? I’d say it goes by owner in initiative order. Or is it just that the resolved Contract card gets immediately removed and replaced after all Captains pursuing that Contract have suceeded, failed or passed according to their Initiative? The Contract get replaced after all eligible Captains pursing that Contract have succeeded, failed, or passed. So in other words once the last eligible Captain pursuing the Contract have a chance to fulfill it. So if you are pursing the contract and have had a chance to fulfill it, but cant meet a requirement becomes uncommitted if that Contract is removed from play. This is correct. But technically there should be a separate stage to the Resolution Phase to make this work more smoothly. We will address it in errata.